As part of Plastic Free July, Virginia and I have both pledged to avoid purchasing single-use plastics this month. It's actually been a lot easier than we were expecting. Strangely, it's fun - almost a game where we high 5 each other whenever we find a new alternative to a plastic-wrapped product we would have used before. Why on earth would we want to do this plastic free challenge? Our society has created a huge problem for ourselves, with the now plastic-dominated world we live in. The stuff seems to be everywhere. (Think about it - it's on our food, our cosmetics, in our gadgets, our cars, planes... it goes on). But the trouble is, the stuff doesn't go away. Plastics 'break up', rather than breaking down; making them permanent pollution. Every piece of plastic ever created still exists. How crazy is that?! And a huge amount of it ends up in our waterways and oceans, where it causes harm to our beautiful sea life. Apparently by 2050, it's predicted that there will be more plastic in our oceans than fish! 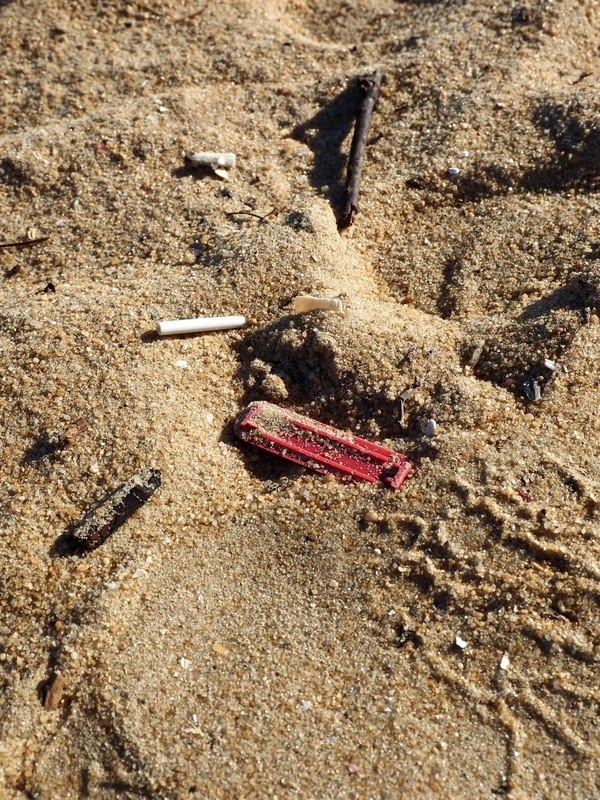 We really noticed the vast amount of plastic pollution at one of our local Melbourne beaches last weekend. Amongst the sand & shells, can you spot all the tiny flecks of plastic? You can learn more about the Plastic Free July initiative, how you can get involved, and some of our tips for making it simple in this earlier feature we wrote. Today though, we want to share our experiences of the month so far with you. What have we found quite challenging, and what has been relatively simple? Firstly too, I'll note what we have and haven't been avoiding, as the Plastic Free July initiative allows you to set your own guidelines on this one. Some beauty products contained in plastic containers, or are in glass containers but have plastic pumps/lids. Plastic Free July Tip: buy legumes & grains from bulk food stores, then batch cook them & store in fridge/freezer for quick, plastic-free meals. With just a little extra thought and planning, it's actually been quite simple to cut down on most things. These have been pretty easy to keep plastic free. We generally head to our local organic store or a market for these, which have minimal plastic packaging anyway. Instead of reaching for a single-use plastic bag to store items in, we've been bringing in our own reusable produce bags (from ONYA, made from recycled plastic bottles), or using paper bags if we run out or forget to bring our bags. Last week's fruit & veggie shop, packed in our ONYA produce bags, made from recycled plastic bottles. This allows us to get by at supermarkets too, BUT the frustrating thing is that their loose produce is often more expensive than when the exact same thing is wrapped in plastic.. grrr. This one is definitely trickier than fruit and veg! Usually, we buy the reduced really good, artisan sourdough breads that are half price for being a day or so old. (Hey, don't judge us 😅). None of that for us this month though! All of these half-price breads (at least in stores we go to) are wrapped in plastic. Supermarket brand breads all come in plastic too, so these are also off the cards. Our solution has been to get ourselves some cloth bags (made from organic cotton, from our beloved The Enviro Shop in Northcote, Melbourne), and to take these along to bakeries and markets. Our weekly bread shop, packed in cloth produce bags (these are from The Enviro Shop in Northcote, Melbourne, and are made with organic cotton). All of our experiences with this so far have been quite positive, and shop assistants are more than happy to use our cloth bags (or a paper bag if we don't have them on hand). a) We need to specifically seek out places with loose bread (bakeries, markets, or gourmet stores). b) It generally costs more than 'supermarket' brands, or artisan brands' reduced loaves. c) Some of favourite artisan brands only sell in plastic, so we have to miss out on them. Still, in the greater scheme of things, it's not too bad. I'm sure we will discover more and more fantastic artisan bakeries too. We hit up the bulk / package-free produce stores! It's actually such a fun way to shop, and it's often cheaper too! Stocking up on bulk legumes from one of our favourite bulk food organic stores in Melbourne - Terre Madre. Glug glug.. we LOVE this Australian olive oil brand, and we were super excited to find it in bulk! Can you spy the fill-your-own-jar soy and tamari sauces in the background there too? (At Friends of the Earth, Collingwood). We even found package-free / self-serve tofu!! We found this at Friends of The Earth, which is a volunteer run food co-op & vegetarian cafe, in Collingwood, Melbourne. Bulk stores to the rescue again! We've been visiting Friends of The Earth for these, as it has a fantastic (and large) selection of cleaning products, both for your house and for yourself. (Also, we love online store Flora & Fauna for vegan + eco-friendly beauty and cleaning products). Are you joining the #WarOnWaste and taking part in Plastic Free July too? What simple swaps have you been making, and what have you found most challenging? You can follow along with our Plastic Free July experiences on Instagram & Facebook too.